How do you like your cinammon rolls? Do you like them more like cake or more like bread? Do you like them filled with all kinds of things and extra sweet, or stripped down? Do you like them small and manageable or extra extra large like the one above? 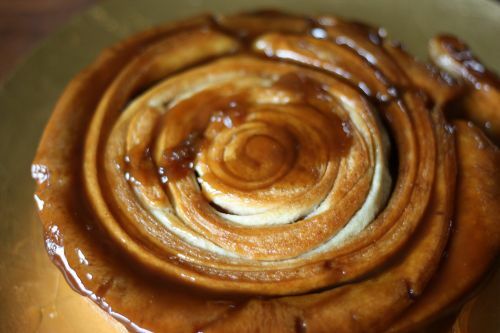 For me, the ultimate cinammon roll can be found at Holly B’s Bakery on Lopez Island. They are made with a bread dough, so they are not at all cakey. They have a restrained amount of raisins and sliced almonds in them, and are sweetened with equal parts brown and white sugar. The effect is almost carmel-y but they are not overly sweet. One of life’s great pleasures is sitting at one of the communal tables on the porch and slowly unwinding your perfect treasure until you get to the final bite, the middle, which is the very best part of the whole thing. I have the recipe for those extraordinary rolls, I just haven’t made them yet. Several months ago, when I first bought Flo Braker’s Baking for All Occasions, the photo that truly jumped off the page was for this Butterscotch Spiral Coffee Cake. 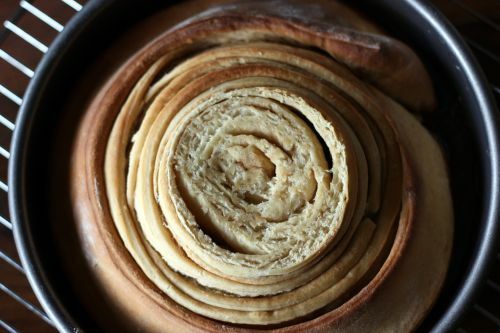 What it is, really, is a giant cinnamon roll and who wouldn’t want that? But I actually put this book away without making anything for many months because I really don’t like how it is laid out. The chapters have titles like “Blue Ribbon Worthy”, “Baking for a Rainy Day”, and “Ready to Share” – great for perusing, but not the best when you actually want to find a recipe. I pulled the book out several times and each time I put it back, annoyed. When our lovely friend Joy invited us to the annual Easter egg hunt/brunch at their house, I asked if I could bring a coffee cake. I almost made this one, but remembered that I wanted to try this giant cinammon roll. The dough is a joy to work with, very forgiving and responsive to what you want to do with it. The rising times are short, making this a possible cake to start in the morning and easily serve to your brunch guests. The wow factor is high. The taste is, well, pretty good. It’s quite bread-y and not very sweet. I think the spices could be punched up a bit to give the actual cake part more flavor. The glaze is spectacular but there isn’t much of it. I had some problems with the middle part being too high for the rest of the cake so I had to trim it off. There were other minor problems along the way, some of them my fault (like the butter explosion in the microwave), but all in all, it’s a recipe I would make again. Or maybe I’ll just make those Holly B’s cinammon rolls instead. Braker says this serves 14-16 but I think 10 is closer to reality. She also says the cake is best the day it is made and I think that is true. We ate it the next day and it was still good, just not as tender. To Make the Dough: Stir together 2 cups of the flour, the sugar, yeast, salt, cardamom, nutmeg, and cinnamon in the bowl of a stand mixer; set aside. In a small, heavy saucepan, combine the milk and butter and heat over low heat just until the butter melts. Add the water and set aside until warm, about 1 minute. Pour the milk mixture over the flour-yeast mixture and mix well with a rubber spatula until all of the dry ingredients are moistened. Attach the bowl to the mixer, and fit the mixer with the paddle attachment. With the mixer on low speed, add the eggs, on at a time, beat after each addition until incorporated. Add the vanilla in the final moments of mixing. Stop the mixer, add 1/2 cup more flour and resume mixing on low speed until smooth, 30-45 more seconds. Add 2 tablespoons additional flour and resume mixing on medium speed until the dough is smooth, still soft, and slightly sticky, about 45 seconds. Sprinkle the work surface with 1 tablespoon of flour and center the dough on the flour. Knead the dough gently until it is smooth and no longer sticky, adding an additional 1-2 tablespoons flour only if necessary to prevent stickiness. Place the dough in a large bowl, cover the bowl securely with plastic wrap, and let the dough rise in a warm place until doubled in bulk, 45-60 minutes. The dough is ready when a finger gently pressed into it leaves an indentation. Meanwhile prepare the baking pan, the glaze and the filling. To Make the Cinnamon-Butter Filling: In a small bowl or cup, stir the cinnamon into the butter; set aside. Before Baking: Center a rack in the oven and preheat the oven to 350 degrees. To Assemble the Coffee Cake: Gently deflate the dough. On a lightly floured work surface, roll out the dough into a 16 by 12-inch rectangle. Using a pastry brush, spread the butter-cinnamon mixture evenly over the dough. Cut the dough lengthwise into six 2-inch-wide strips. (A pizza cutter is helpful here.) Loosely (so the dough has some give as it expands in the oven) roll up 1 strip and place it, cut edge up, in the center of the prepared pan on top of the glaze. One at a time, coil the remaining dough strips around the center strip, starting each strip at the end of the previous one, to make a single large spiral. As you roll the dough strips around the coffee cake, the butter-cinnamon side of the dough strips should be facing inside. 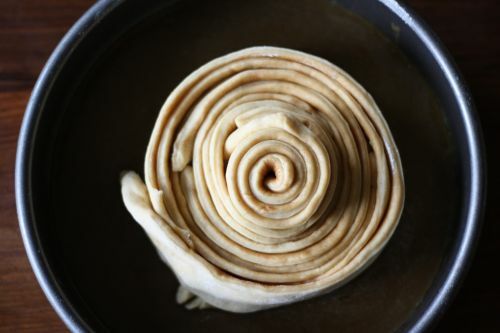 (When you finish forming he spiral there will be plenty of space sleft in the pan. The spaces around the dough will fill in as the dough bakes.) Loosely cover the pan with plastic wrap and let teh cake rise in a warm place until it is almost doubled in size, about 30 minutes. Bake the coffee cake until the top is deep golden brown, about 35 minutes. Check after 20 minutes to make sure the cake is not browning too fast. If it is, cover the top loosely with aluminum foil for th ealst 10-15 minutes of baking to prevent overbrowning. Transfer to a wire rack (if you have used foil, remove it) and let cool for 10 minutes. Gently tilt the pan and tap the sides on a counter to release the cake sides, then invert a serving plate on top of the cake and invert the pan and the plate. Leave the pan on the cake for 1 minute, so the glaze transfers to the cake, then gently lift off the pan. Using a rubber spatula, scrape out any butterscotch syrup remaining in the pan and spread it over the warm surface of the cake. Serve the cake warm or at room temperature, cut into wedges gently with a serrated knife. This coffee cake is best the day it is made. of course I must have the recipe, absolutely will e-mail you soon, and beg that you’ll send me the recipe. That’s a lot of layers…..love ‘em! I like cinnamon rolls in just about any way, shape, or form, and your cake looks delicious! Dana, those photos are beau-tiful! I love them. I cannot get over how elegant this new home is!